Nearly fifty years ago, Neil Armstrong and Buzz Aldrin walked on the surface of the moon for the first time ever. The historic Apollo 11 Mission landed at the Sea of Tranquility, a large, dark basaltic lava flow. 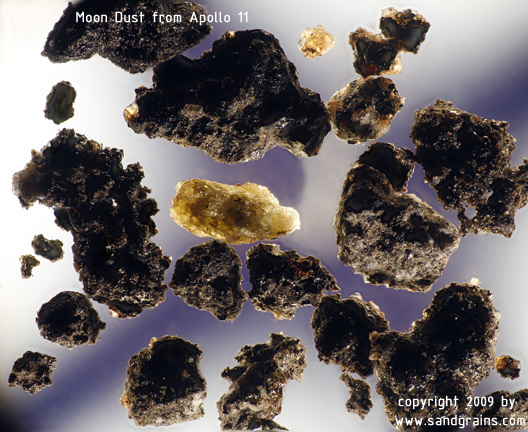 They returned to earth with samples of lunar rocks, sand, and dust so scientists could search for clues to the origin of the moon and its geologic development. 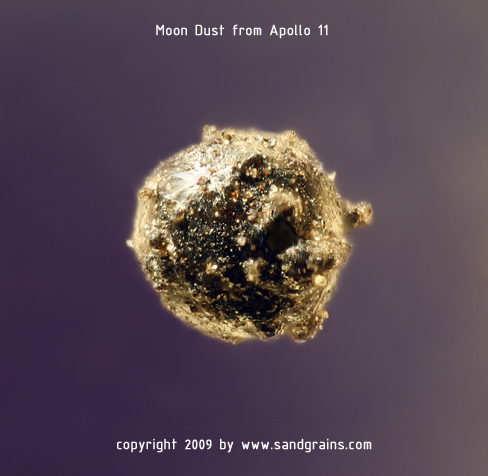 Since that time, microscopes have been greatly improved, allowing us to see moon dust in ways that were not possible just a few years ago. 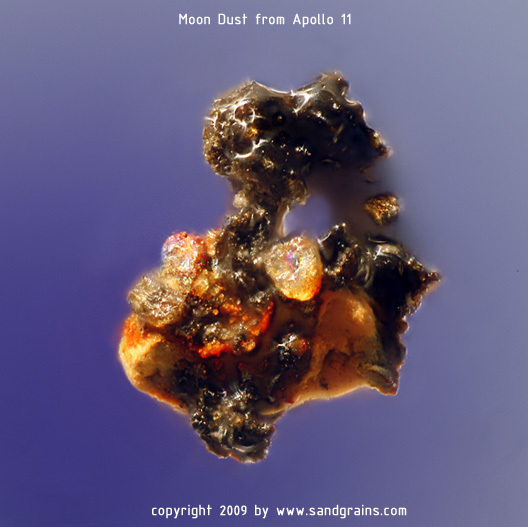 Greenberg is creating deep-focus color images of the lunar particles, some of which are shown here. The magnifications range from 300 to 600 times. By looking at the same particles with different types of microscopes, we are better able to piece together the intricate story each of these tiny bits of dust has to tell us. The results have shown that the moon consists of the exact same material the crust of the Earth is made from. Scientists believe that the moon was formed by a collision of the Earth with a Mars-sized object about 4 billion years ago. Through the force of gravity, the debris from the collision came together to form the moon. The moon has no atmosphere and no water. That means that rocks don’t erode in the same way as they do on earth. Instead, the moon is continually being bombarded by meteorites and micro meteorites, some the size of a small bit of dust, but travelling at tens of thousands of miles per hour. With no atmosphere to stop them, they hit the moon and instantly vaporize the underlying rock. Over the years, the moon has become covered in a fine powder or dust, the result of the continual micro impacts. Some of the sand and dust looks like dark, basaltic lava. 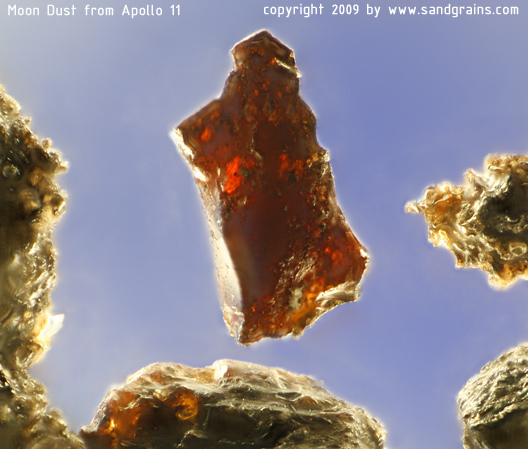 Other grains are clearly crystallized minerals of different sorts. 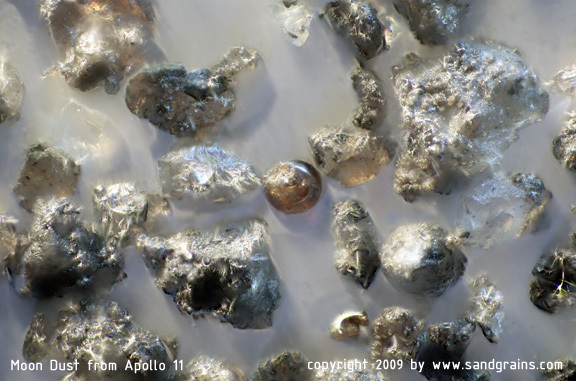 Some are tiny sphere-like objects that are formed when a tiny bit of rock vaporizes and cools into a microscopic sphere. 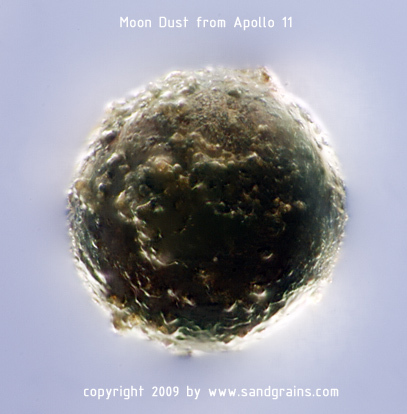 The most unique grains are called agglutinates, which are formed when tiny molten droplets bind together pre-existing grains of sand. You can order prints of any of the images on this website. Also available are prints of any images from Gary Greenberg's books. Custom sizing and commissions are available upon request. Contact gary@sandgrains.com to make arrangements. Metallic Prints: Available in several different sizes (use the drop-down menu) and printed on special glossy metalic photo paper. Has more "pop" than the standard prints yet more affordable than the aluminum prints below. Prices below do not include the $20 shipping ($55 international shipping). The metallic prints are UNFRAMED. We apologize that we are currently not taking orders outside of the USA. Aluminum Prints: 10" x15" metallic prints mounted on an aluminum sheet. The aluminum sheet backing is a glossy, hi-tech, hi-resolution way to present these stunning images. The aluminum is backed with 4 small blocks so that when the print is hung on the wall it appears to float. $350, plus $25 shipping ($60 international shipping).